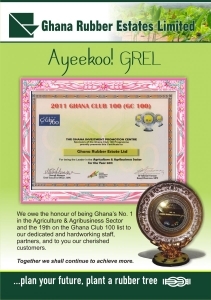 GREL contributes positively to the Ghanaian economy through increased output for export as well as taxes both directly and indirectly. The company currently offers direct employment for 544 salaried employees and waged workers. In addition, about 3,149 persons are employed by our contractors. The out grower project benefiting 3,500 farm families, supports employment and improves income levels and standards of living. This is helping to reduce the urban drift and creating a source of livelihood for otherwise unemployed youths. GREL also assists the local communities in their development programmes through ACLANGO (Association of Chiefs on whose land GREL operates). Some of the development programmes include building of schools, town halls, public toilets, roads, electrification projects etc. GREL is currently contributing positively to Ghana’s educational system and has three (3) first-cycle schools at Tsibu, Chavene and Nsuaem with a library at kyekyewere. GREL has also constructed several schools and nurseries for some operational areas. GREL organizes free vacation classes for children in its operational area and grants annually scholarships to sixteen (16) brilliant but needy children of the communities to further their education in second cycle institutions. There are currently two (2) students pursuing university programs also on scholarship scheme. The number of scholarship shall increase to three (3) per each traditional area in 2013. GREL’s Clinic at Abura extends medical services to residents of the communities and the general public. Through its technical assistance programmes from institutions such as CIRAD-CPN and Michelin of France the company transfers technology to Ghana. Through the development and expansion of the plantations, infrastructure is extended to remote rural communities, which hitherto, were inaccessible – thus complementing the development programme of the Ghanaian Government.